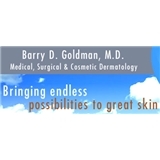 Goldman Dermatology (New York) - Book Appointment Online! Our mission is to provide high quality dermatological skin care. We strive to individualize treatment to meet each patient's unique needs and requests. We aim to provide courteous, compassionate care while sticking to the busy schedules of the New York City workers in our practice. We are highly skilled in the treatment and removal of moles and skin cancers. By offering full service dermatology, cosmetic and surgical services under one roof, each patient can feel confident that they are receiving the services that are appropriate for their individual concerns. Dr. Radoszycki was very soft spoken and had a calming energy about her. She took her time answering my questions. It was quick and easy! I barely waited. Dr. Goldman was very personable and did a great job of explaining everything in a relatable, and digestible way. Would highly recommend.